The contents of this page for Old Ways At Our House is still under construction. Just getting started on this page, Please check back later! 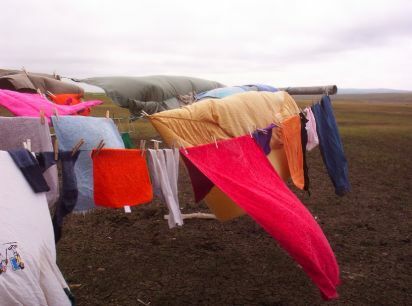 Deron and I live way out on the Prairie and do many things the old way. Yes, yes, remember, milking goats is not a dress up affair. LOL Many people think they want a cow for milk.....cows do give milk, cows give a lot of milk. Cows give more milk then most people will ever use in a day! Most Dairy goats will give over a gallon of milk a day. PER DAY! Goats are smaller then cows, take up less room, eat less and are easier to work with and milk then a cow. 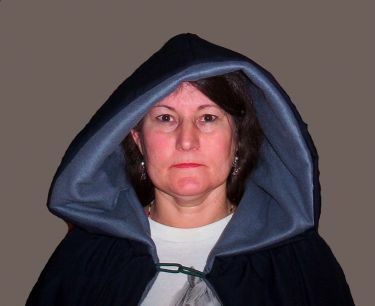 Do a little research on goat's milk and you might just ask yourself, "Why does the USA not drink goat's milk, rather then cow's milk, like the rest of the world?" Goat's milk is very good for people and goat's milk can be used for any type mammal baby as a full and complete supplement. 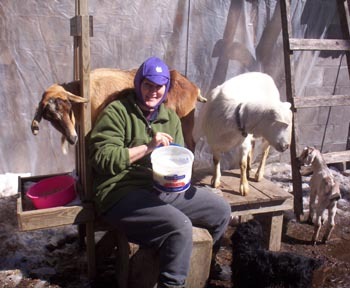 I do have a whole page about Goat Milking on our www.workinggoats.com and or our www.faroutliving.com sites if you are interested in learning more about it and how it works for us. Yes, we have chickens. We love our chickens and the eggs they product. We do not have refrigeration and so buying eggs in town does not work out for us. 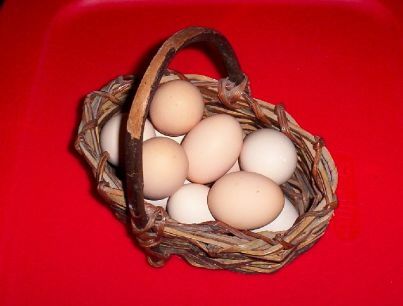 We have a few chickens so that we collect a few eggs per day for our own use....pretty farm fresh eggs too! I have been making my own sewing and craft patterns since I was a kid. It is fun for me. So when we started getting interested in the Renaissance Fairs and meetings and such, I went to the sewing machine and started making Deron and myself "some garb". I love to crochet. I am self taught. Again, many times, like with these snoods, I make my own patterns. I have made sweaters, hats, afkans, many many toys, snoods and more. 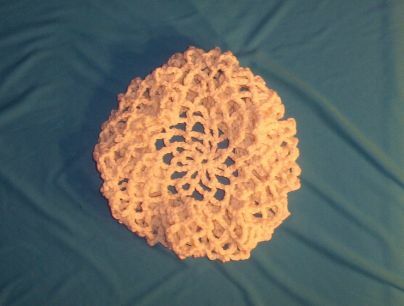 Crocheting is fun and easy to do. It is a real nerve calmer and you can feel pretty accomplished when you finish a project. You can do an Internet search on learning to crochet. It is easy to learn, step by step. Then there is also the spinning of your own wool too. I must admit, it has been a while, but I have spun the wool of our own Engish and French Angora Rabbits as well as our own Llamas and one Sheep. Deron made my Drop Spindle and my Navaho Spindles and one day I would love to own and use a spinning wheel. I have used a Hook Spindle and have even been able to try spinning wheels that belonged to friends of mine....what a delight! This photo is of Fancy, who won top awards at the fair in Angigo, WI. In the photo she was about 7 weeks old. You can see how nice her wool was coming in even at an early age. 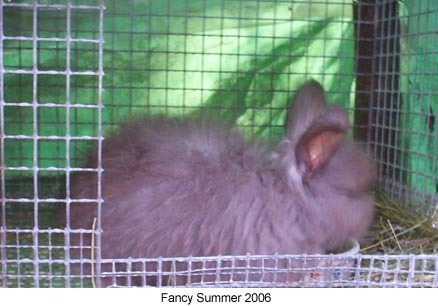 Rabbits are inexpensive and easy to keep and product a good amount of wool if out of good blood lines. I usually use suede for the fold over covers, maybe a deer antler button to close them and the pages are hand stitched into the book itself. Here's an almost lost "art". 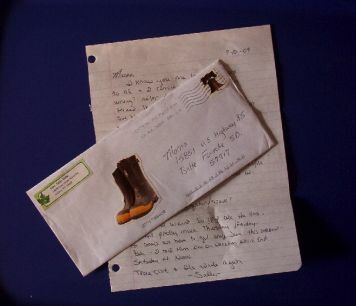 When was the last time you received a hand written letter? Not a birthday card, not a Christmas card with a typed out "here's what we did all year" 100 copied letter, but a real hand written letter? I actually do send my friends, from time to time, a hand written letter...and thy love getting them. There is something so personal, so warm about a hand written letter. You took the time, you went to the mailbox, and now they are holding a letter from your hands to theirs. Long after the email is deleted or the computer crashes and looses all those notes you have saved, that hand written letter will still be in someones desk drawer. You do not have to have fancy stationary paper or any fancy envelopes. Just grab a pen and paper and write someone....you will hear from them very soon after, sometimes in a handwritten letter back to you. For years, since I was a kid, I have had and worked with and trained animals. I have never had the kind of money it takes to buy the equipment, so again, I designed and crafted my own....that is how my animal equipment businesses got started. Not only did I design the goat's harness in the photo (and sell them on my www.workinggoats.com website) Deron came up with the inexpensive way to make and attach the shafts to the wagon the goat (Rena) is pulling. Training working animals is not rocket science....but you do need to know what your are doing, that is, how to get from point A to point B. I have trained many types of animals. I have done so mostly by reading good books and jumping in and doing it. Start with smaller animals. Everyone wants a horse. Many want to train their horses to pull carts, wagons, plows, ect. But let me tell you, training a horse can be deadly if you do not know the dynamaics of horses as well as how to train them. 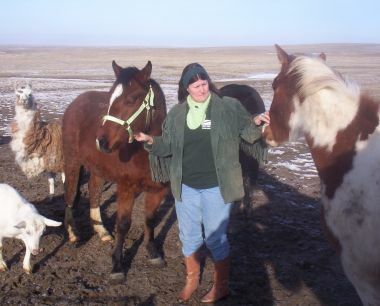 This photo is of me with two fillies/horses we are training a llama and goat we have trained and in the background, our farm dog that we also trained. this coming soon.....something Deron and I have wanted to do for a long time. We have researched this and are planning to make Goat's Milk Soap this winter...it is soooooo good for your skin. 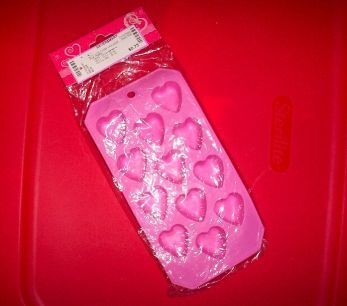 I have already bought a few molds and look forward to making the cute animal shaped soaps. I have hand crafted several pairs of suede Moccasins over the years....and yes, wear/wore them. Mine were made with authentic Indian Patterns and I cut them from a large thick piece of hand chosen suede. All were hand stitched, some I prepunched the leather others I worked the needle (and not easily) stitch by stitch. I have made some moccasins with kits, but I prefer to make my own from start of choosing the patterns and leather to hand stitching. Now I am going to have to "dig some out" for photos. 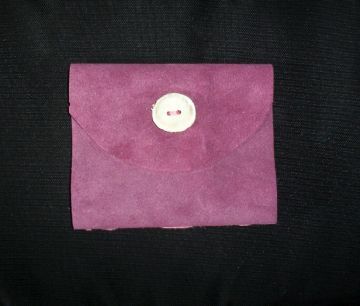 I have also made purses, clothing, all kinds of items with suede hides, many from my pattern designs.